Demand is falling for lower-priced homes, but prices have not. If this summer is worse than expected for the housing market, we could see some nice buying opportunities later in the year. The housing market has done extremely well over the past couple of years, with the average U.S. home price up about 27% since bottoming in early 2012. This has caused a slight reduction in selling activity, but prices continue to hold steady, for now. However, a buying opportunity, especially for lower-priced homes, may be right around the corner. The latest data indicates a significant drop in demand in the lower price ranges. Once sellers realize the market isn't quite as hot as they were hoping for, we could see some "started" homes selling at steep discounts later this year. Basically, we're seeing fewer sales because millennials have become very hesitant to buy homes. Higher student loan and credit card debt than recent generations, as well as a poor job market for younger adults have made the younger generation of Americans more likely to rent than buy. According to data from the Federal Reserve, only 22% of 30 year olds with student loan debt have a home loan, down from 34% in 2008. And, only 63% of Americans between the ages of 18 and 31 had jobs in 2012, the most recent year available, which was down from 70% five years earlier. This combined with the fact that wages have actually fallen for workers in that age group, has produced significantly lower demand for homes in the lower price ranges. Sales of homes in the $100,000 to $250,000 price range have fallen by 6.6% over the past year, and homes under $100,000 have fallen by 14.5%. In fact, demand for homes in every price range below $1 million fell year over year. So, while home sales have definitely fallen as you can see on the chart above, the drop has been even more dramatic for most of the market. Higher demand for expensive homes is skewing the data and making the housing market look more robust than it really is. Why later this year, and not now? It doesn't matter what we're talking about: houses, stocks, consumer goods, or pretty much anything else you can buy. It's generally a bad idea to buy something when everyone else wants to. The summer season is typically the busiest time of the year in real estate. Kids are out of school, making it easier for families to pack up and move. Plus, the weather is more conducive to house-hunting than it is the rest of the year. In fact, according to realtor.com, about 50% of all home sales occur during the summer months. Fall, and especially winter, are the least favorable time of year for sellers. 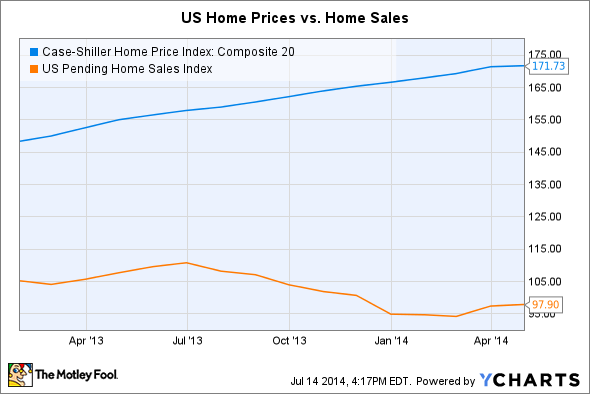 So, bargains in the housing market are more likely to occur after the summer selling season. Sellers whose homes are still on the market tend to become more eager to sell and may be more willing to make a deal. This summer is already shaping up to be worse than expected. Housing starts in May dropped 6.5% after a lowered April number. Spring is historically the time the housing market begins to pick up, and a lot of experts had predicted a strong spring after this year's brutal winter. Even during the summer selling season, it's definitely a buyer's market for lower-priced homes in most of the country. Of course, every local market is different. Maybe starter homes are flying off the shelves in your area. However, a drop of nearly 15% in sales of lower-priced homes makes it very likely that inventories are up in your area and homes are sitting on the market longer. This is an excellent recipe for bargains, and once the summer sales rush comes to a close, your first home could become much more affordable.